Environmental Companions are volunteers who are ready to take other people along with them to explore both new and familiar environments, accentuating good environmental manners in a broad perspective (combining nature, social practices and cultural heritage). Environmental Companions encourage people to observe their habitat with their senses open and, if need be, take action. Environmental Companions are not guides but fellow wonderers, with whom you can deepen your relationship with various environments and discuss them. Through environmental companionship, tacit knowledge and traditions related to people’s own neighbourhood and everyday expertise are passed on to the new people who experience them. Environmental Companions can work with groups of children, young people, senior citizens or immigrants or other special groups, as well as village societies and organisations, for example. People can also act as Companions within their own circle of friends or with people in their neighbourhood. The idea of starting environmental companion activities was born in the early 2010s, when the Golden Forest exhibition produced by the Association for Rural Culture and Education toured Finland. One of the stops of the exhibition was Jyväskylä, where Art and Culture Companions have already been operating for several years. An Art and Culture Companion introduces people to art and culture as hobbies. The Jyväskylä Art Museum trained the first group of Art and Culture Companions who were enthusiastic about the themes of nature and the environment to act as companions in environmental matters, too. So far, environmental companion training has been arranged in 9 cities in Finland. The activities have resulted in good experiences, and the Association for Rural Culture and Education has decided to continue developing the operating model further: its communal side has been strengthened and the contents have been expanded to support activities in different kinds of environments. In addition to the natural and cultural environments, the method is also applied to observing the social environment. The renewed environmental companionship is a method of activating and developing the community, which encourages people’s interest in observing their own neighbourhood with new eyes. The method is based on participation and interaction: the goal is to increase participation, and build discussion and activities in the community and the everyday environment. 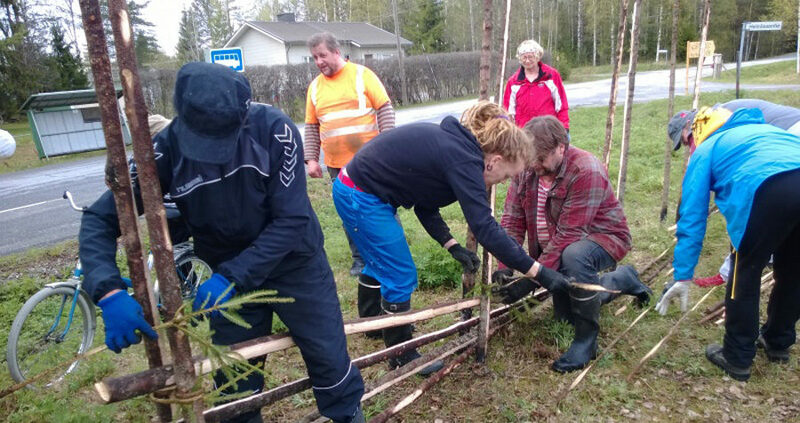 Funding for developing the environmental companion activities has been provided by parties such as the Ministry of the Environment, the Rural Policy Committee, the Kone Foundation, the Keskitien Tukisäätiö foundation and the Alfred Kordelin Foundation. The funding has been used to develop the contents of the Environmental Companion training and to arrange pilot training and meetings for trained companions. The aim of environmental companion activities is to diversify the points of view, attitudes and operating methods, through which people experience their living environment and its changes. The activities support deepening the relationship with the natural, cultural and social environments and increasing experiential knowledge about the locality, communities and participation. The Association for Rural Culture and Education introduces Environmental Companions to different themes within the framework of its project activities. In addition to training the Companions, the Association for Rural Culture and Education is developing a pedagogical model for introducing people to the method for the use of companies, among others, as well as implementing various communal processes through the method. The operating model is also being introduced in municipalities, such as in Posio and Kyyjärvi. Environmental companionship means doing things together, discussing them, and opening up concepts related to the themes selected by the group. In environmental companionship, people visit thematically interesting and suitable sites in their own living environment, when possible, share stories and meaning related to the sites, and build a mutual understanding by studying different points of view. Environmental companionship can help a group/residents to put themselves in other people’s place and consider various issues and the environment from different points of view. Companionship encourages people to learn new things and develop a relationship with their own living environment throughout their lives. It is also an excellent way to introduce new residents to their home region and living environment. The process is guided by an Environmental Companion or an expert from the Association for Rural Culture and Education, trained in the method. Among other things, the method uses elements of sociocultural animation and empowering guidance as well as various teamwork methods. A key factor of the method is that the Environmental Companion supports the communal process instead of acting as an instructor: the aim is to encourage and support the group/residents to see, think and act together and to develop the activities further. Visiting places and inspiring people to see new and different points of view. Promoting interaction in the community, sharing knowledge and competence. Developing environments by doing things together and enabling participation.